ABA fishing, Triton Boats, Mercury, Fitzgerald Rods, Missile Baits, Optima Batteries, Power Pole, Eco Pro Tungsten, Seaguar, Simms, Lews Reels, Trotter Marine. I have a wonderful family that supports me tremendously with my fishing career. I started out fishing local club tournaments as a non-boater and moved on to fish ABA Weekend Series events as a non-boater. I would love to win the Ram National Championship and to qualify for the Bassmaster Classic. Punching thick vegetation with a 1.5oz Eco Pro Tungsten weight, a Missile Baits D Bomb, and a 7'10" H Fitzgerald Rod for big bass! This technique has won me a lot of money. Winning the 2011 Weekend Series National Championship as a non-boater. I research proven techniques for the body of water I'm going to for that time of year and determine how I can best attack the lake using my strengths. Missile baits shockwave, swim jig with Missile baits twin turbo trailer, and a chatterbait with a 3.5in Missile baits shockwave trailer. 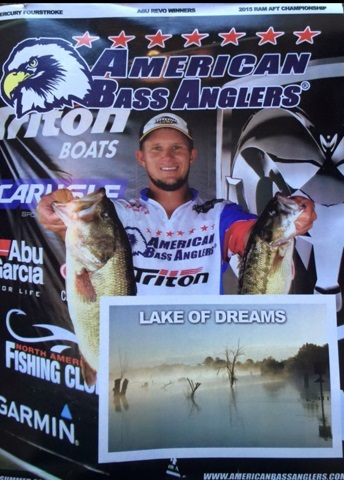 Winning the Weekend Series National Championship in Santee Cooper, SC with a chatterbait. Adjusting to the changing conditions from practice through the tournament. You have to have a short memory when it comes to bad tournament finishes! Follow your dreams and start out fishing ABA events as a co-angler until you gain some experience. During the summer, some of the biggest fish in the lake get super shallow under thick grass mats. Attack these fish with a 1.5oz Eco Pro Tungsten weight, a Missile Baits D bomb, and a 7'10" H Fitzgerald rod. This is a tournament winning, big fish technique!